This page reflects my experience in the field of software engineering. Please click on an area of interest below, or try the linear version (printer friendly). I was involved in the company Spell of Play Studios in my spare time from late 2005 to early 2010. Spell of Play is a small gaming studio that develops games for the Windows platform, run as an informal design collective. We developed a digital distribution platform called hUb based entirely on open-source software, offering a growing number of both free and commercial games. Spell of Play is interested in what we call "collaborative game development", a process in which the actual customers are heavily involved in the continued development of the games. We released our games early and updated them often, a process made completely seamless and transparent to the end user via the auto-update functionality offered by the hUb platform. While being involved in many aspects of programming, game and audio design on hUb, I am the sole creator of the games in the UfoPilot series. I have also collaborated with Madeleine Bengtsson on Bloom. 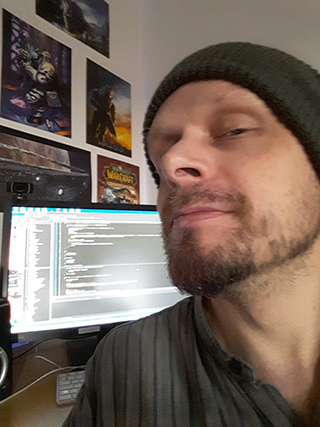 The developers at Spell of Play use primarily C++ and immediate mode techniques as our main client/games-side development tools, as well as utilising PHP/MySQL on cheap commercially available web-hotel backends, a combination that we found to be extremely productive. An interesting detail is that all development has to date been done in a distributed fashion, with team members collaborating from all over Sweden using open-source software (notably SubVersion and Trac). While I am still active in the forums at Spell of Play, my current indie game development work is outside the scope of this collaboration.